Rugby Australia said Thursday it plans to terminate the fullback's contract with the national team after he made anti-gay comments on social media for the second year in a row. When Folau made similar remarks on April 5, 2018, he escaped with a warning but no sanction. Now, only five months from the start of the Rugby World Cup in Japan, where Folau was expected to be one of Australia's leading players, Rugby Australia wasn't so lenient. RA chief executive Raelene Castle said in a statement that she and NSW Rugby Union head Andrew Hore made "repeated attempts" to contact Folau directly and via his representatives on Thursday, but that he failed to communicate with them. "As a code we have made it clear to Israel formally and repeatedly that any social media posts or commentary that is in any way disrespectful to people because of their sexuality will result in disciplinary action," Castle said. "In the absence of compelling mitigating factors, it is our intention to terminate his contract." Folau, one of the sport's top players, published a message on his Instagram account late Wednesday saying that hell awaits "drunks, homosexuals, adulterers, liars, fornicators, thieves, atheists, idolators." 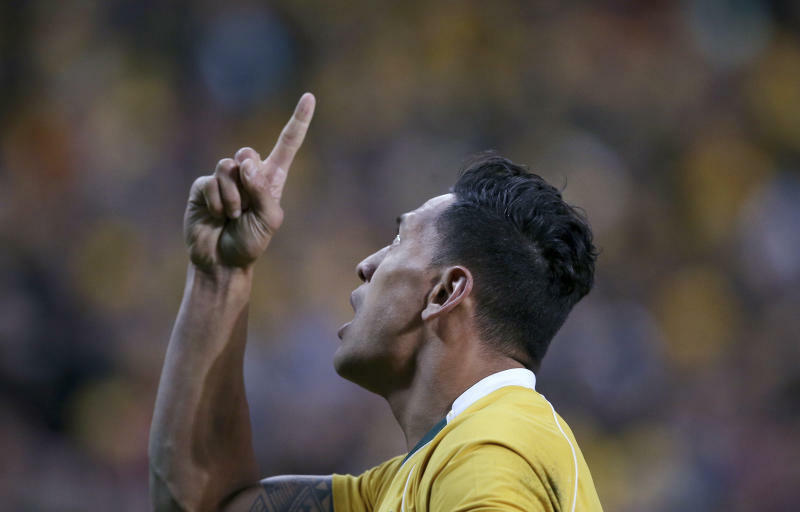 Castle said that while Folau was entitled to his religious beliefs, "the way in which he has expressed these beliefs is inconsistent with the values of the sport. We want to make it clear that he does not speak for the game with his recent social media posts." "Israel has failed to understand ... that he cannot share material on social media that condemns, vilifies or discriminates against people on the basis of their sexuality," Castle said. 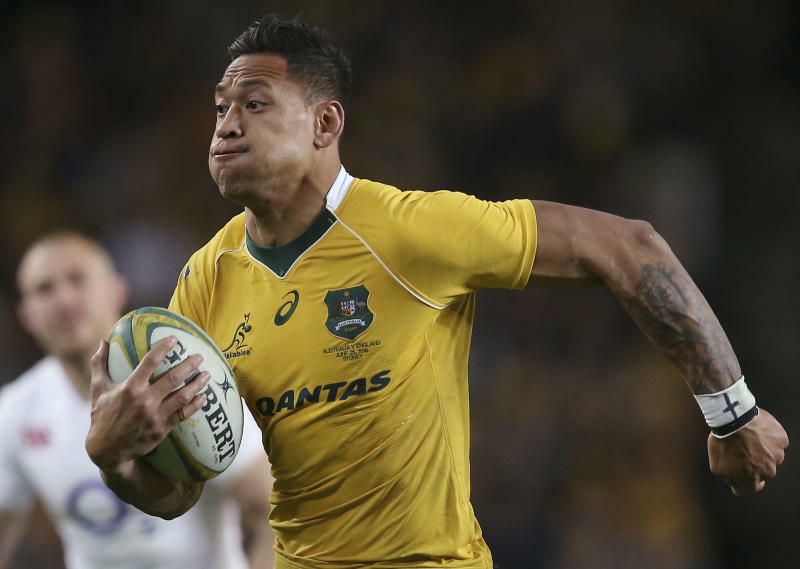 Australian airline Qantas, a national team sponsor, issued a statement earlier Thursday saying Folau's comments "clearly don't reflect the spirit of inclusion and diversity that we support." On Thursday, before Rugby Australia's statement, some contemplated that Folau again made the anti-gay comments so he could be released from the new long-term deal. Former Wallabies captain Stirling Mortlock said Folau had "pushed Rugby Australia into a corner and they have to act." "Everyone knows his point of view, right? He's done this a number of times already," Mortlock told the Australian Associated Press. "So it's more (about) what was the motivation ... knowing full well that he was probably going to get sanctioned." Former England rugby international Joe Marler, who plays for London club Harlequins, mocked Folau by posting two images of men kissing. Another former England international, James Haskell, wrote to Folau on Twitter and said "sport has no place for this ... keep it to hate groups. You are an unreal player, but a ... misinformed bigot." Former Wales rugby player Gareth Thomas, who announced he was gay in 2009, wrote on Twitter that people should "not be influenced" by Folau's words and that Thomas had "sympathy" for Folau. Britain-based LGBT charity Stonewall supported Rugby Australia's move.